Practical Fourier Transform Infrared Spectroscopy: Industrial and Laboratory Chemical Analysis presents the Fourier Transform Infrared Spectroscopy (FT-IR) as a valuable analytic tool in solving industrial and laboratory chemical problems. 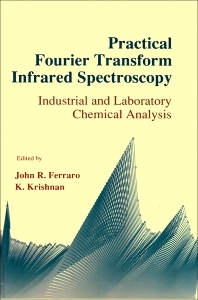 The text provides chapters that deal with the various applications of FT-IR such as the characterization of organic and inorganic superconductors; the study of forensic materials such as controlled drug particles, fragments of polymers, textile fibers, and explosives; identification and quantification of impurities and measurement of epitaxial thickness in silicon; bulk and surface studies and microanalyses of industrial materials; and the identification or determination of unknown compounds. Chemists, industrial researchers, and product engineers will find the book useful.